Successful delivery of the gRNA and the Cas9 into cells is essential to guarantee the high genome editing efficiency. The most efficient CRISPR-Cas9 method is based on the direct delivery of pre-complexed gRNA and Cas9 protein, referred to as Ribonucleoprotein (RNP) delivery. The sequence of our SpCas9 nuclease is carefully optimized to improve its nuclear import, nuclease editing efficiency, and to reduce off-targeting effects. Our SpCas9 nuclease has been developed to reach the highest genome editing efficiency with our RNP transfection reagent jetCRIPSR™. Combine the leading technology for RNP delivery using jetCRISPR™ with the optimal Cas9 protein structure to introduce specific Cas9-mediated genome editing efficiency on a wide variety of cell types. Polyplus-transfection’s SpCas9 Nuclease is a recombinant S. pyogenes Cas9 nuclease that has been optimized to improve nuclear entry following jetCRISPR™-mediated intracellular delivery. The sequence of spCas9 nulcease contains a single SV40 nuclear localization sequence (NLS) in N- and C-terminus (Fig. 1). Fig. 1: Optimized SpCas9 Nuclease design for efficient genome editing. jetCRISPR™ is an innovative transfection reagent for the delivery of RNP complexes to achieve CRISPR-Cas9 mediated genome editing. Choosing the optimal Cas9 sequence is key in enhancing targeted nuclear delivery of the Cas9 protein with the gRNA. Polyplus-transfection’s SpCas9 nuclease leads to higher genome editing than other commercially available Cas9 proteins using jetCRISPR™ transfection reagent (Fig. 2). Fig. 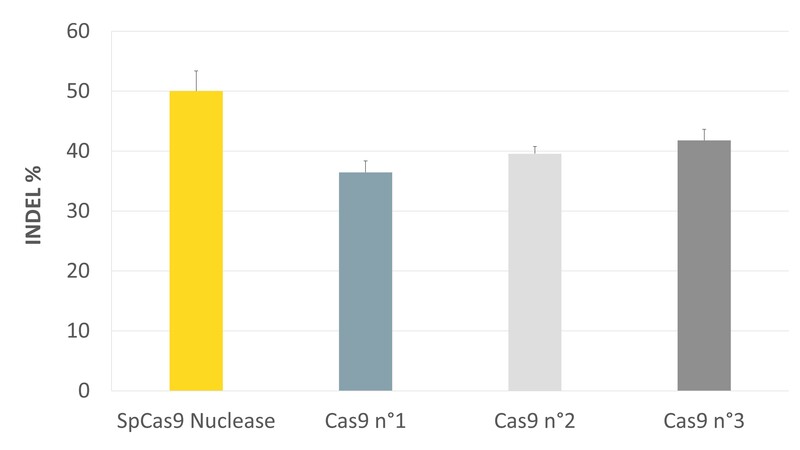 2: Higher genome editing obtained with SpCas9 Nuclease compared to other Cas9 Proteins. 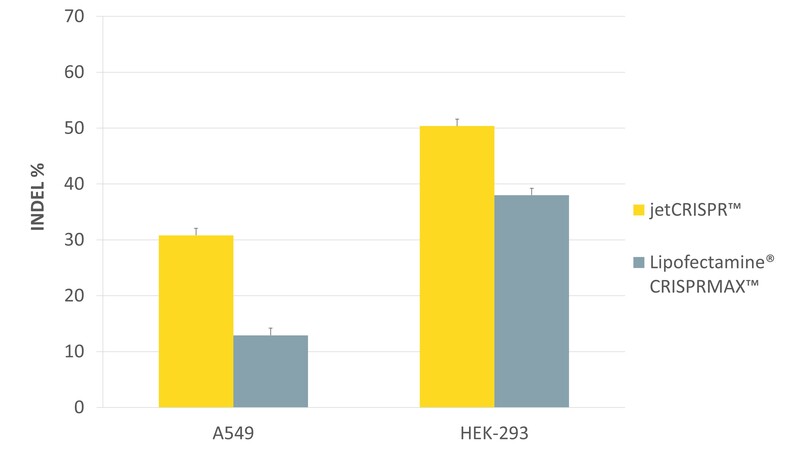 RNP transfections were performed in HEK-293 cells using 30 nM RNP (HPRT1 sgRNA + Cas9 protein) with 0.3 µl of jetCRISPR™ reagent per well of 96-well plate. At 48 h post-transfection, genome editing was assessed by calculating the percentage (%) of INDEL using the T7 endonuclease method. The INDEL % was determined by using Genetools software (Syngene®). jetCRISPR™ transfection reagent achieves higher genome editing efficiency than other competitors, which makes it the product of choice for CRISPR applications. Fig. 2: Superior genome editing efficiency obtained with jetCRISPR™ in comparison with Lipofectamine® CRISPRMAX™. RNP transfections were performed in A549 and HEK-293 cells using 30 nM RNP (SpCas9 Nuclease and HPRT1 sgRNA) with 0.3 µl of jetCRISPR™ reagent or 0.3 µl of Lipofectamine® CRISPRMAX™, per well of a 96-well plate. At 48 h post-transfection, genome editing was assessed by calculating the percentage (%) of INDEL using the T7 endonuclease method. The INDEL % was determined by using Genetools software (Syngene®). Alengo Nyamay’antu (PhD), Technical Support Specialist, talks about transfection trends in genome editing. She provides an overview of solutions to delivery both guide RNA and Cas9 nuclease into cells. 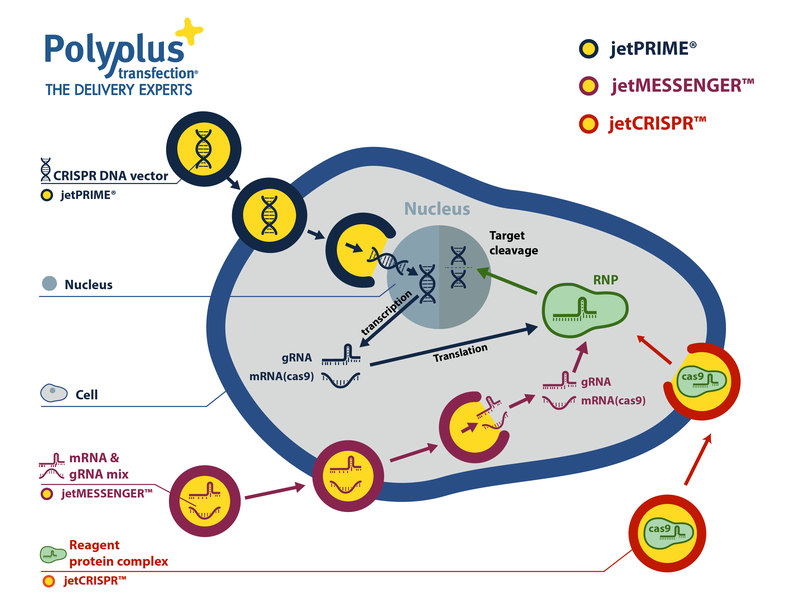 If you have any questions regarding SpCas9 Nuclease and jetCRISPR™, please visit our dedicated Frequently asked questions or contact us at support@polyplus-transfection.com. Every batch of SpCas9 nuclease is tested by an in vitro activity assay using gRNA and linearized DNA target. Each vial is provided with a Certificate of Analysis.